Thor Prohaska, announces he is standing as an Independent Candidate for Dickson at the 2019 federal election. I say the reason that our democracy is not working is because there is no legal requirement in the Australian Constitution or the Commonwealth Electoral Act to ensure that our elected representatives must vote in parliament as directed by the majority in their electorates. Until it is Law that they must represent the majority, our representatives can do whatever They, Their Party or the Donors want, even when it’s not what the majority in the electorate want. 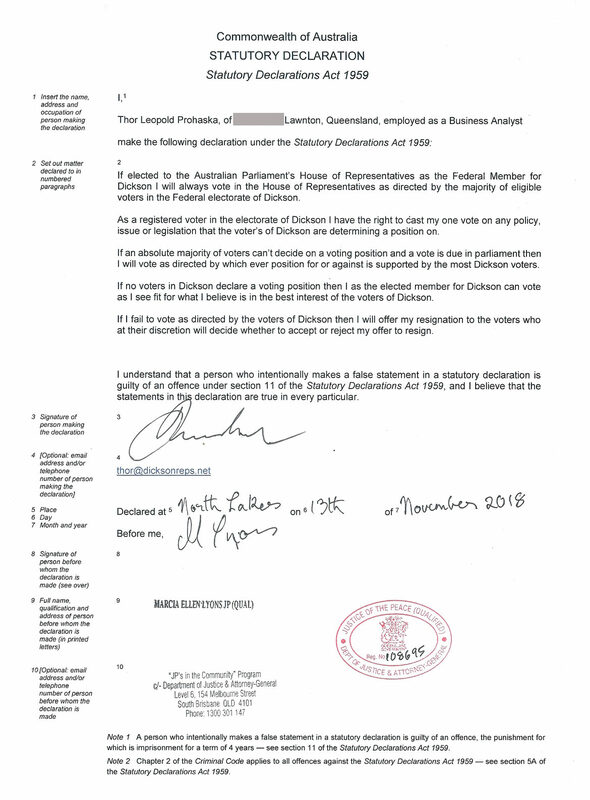 To make it Law for me I have legally bound myself to represent the majority in Dickson via a Commonwealth Statutory Declaration stating that, if I’m elected as the Federal Member for Dickson I pledge to vote in parliament as directed by the majority of Dickson voters. And, if I don’t I’ll offer my resignation to the voters. I now call on all the candidates standing for Dickson to sign the same pledge so whoever is the next Federal Member for Dickson they will represent what the majority want. Without that pledge how can we have a properly functioning democracy?